Last updated: January 17, 2012 . As shown on the figure below, the utricle is one of the two "otolith" organs of the inner ear, (the other one is called the saccule) which function to detect orientation to the vertical and also sense linear movement. While acute injuries to the utricle are known to cause a subjective tilt of the world, it is presently unclear whether chronic injuries of the utricle have a significant and/or recognizable clinical syndrome. One might hypothesis however that fixed or static utricular disorders might be accompanied by imbalance (because they sense motion), and visual disturbance (because the eye's are tilted). Episodic utricular disorders might be accompanied by sensations of tilting or imbalance, but should not be accompanied by vertigo. Episodic saccule dysfunction, in theory, might manifest as a confusion of up and down, or the so-called "inversion illusion". Structures in inner ear, showing utricle and saccule. 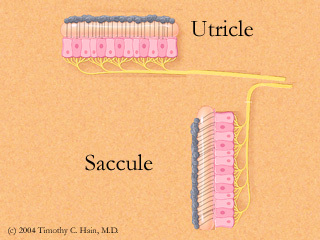 Orientation of utricle (horizontal) and saccule (vertical). An otoconial mass (gray) overlies the hair cells. Shear information is transmitted to the brain via the vestibular nerve. Certain common ear disorders, such as Meniere's disease, pathologically affect both the utricle and saccule. The syndrome "otolithic crisis of Tumarkin" is attributed to an acute mechanical deformation of one of the otolith macules (sensory epithelium). The saccular wall is much thinner to the utricular wall and the saccule expands to much a greater extent than does the utricle (Igarishi et al, 1983). Vestibular nerve disorders such as acoustic neuroma and vestibular neuritis disconnect the utricle from the brain and also case a utricular disorder. Central disturbances such as vertebral TIA's can also cause tilting symptoms resembling a utricular disorder (Ropper, 1983). Human brainstem. 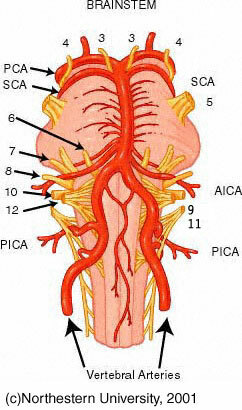 Tilting and inversion illusions have been reported due to strokes related to disease of the vertebral arteries, the posterior inferior cerebellar arteries (PICA), and from the basilar artery (large vessel going down middle of brainstem). Another stroke syndrome called "top of the basilar syndrome", can be accompanied by an illusion that the world has been turned upside down. This stroke is probably not affecting utricular pathways, but can cause similar symptoms. Other causes of inversion illusions included lateral medullary strokes and TIA's, which do affect utricular pathways. Brainstem strokes affecting the medulla may cause severe and permanent subjective and objective tilting of the visual axis (see following). Brandt and Dieterich (1991) suggested that the peripheral and utricular disorders and central disorders resulting in an ocular tilt reaction could be differentiated into three types based on the relative amount of vertical deviation. In utricular deviation, both eyes deviate upwards, but with different amplitudes, as described for "otolithic Tullio". In patients with dorsolateral medullary syndromes, hypertropia of one eye occurs while the other remains in primary position. An example of this would be Wallenberg's syndrome. In midbrain tegmentum lesions, there is simultaneous hypertropia of one eye and hypotropia of the other. Once the event has occurred however, it would seem difficult to separate between these three patterns. At this writing, no reasonable clinical method has been devised to detect unilateral loss of otolith function. Methods have been tried based on assessment of subjective vestibular vertical, and measurement of ocular counter-roll, but they have so far been frustrated by an inability to confine the stimulus (tilt) to one ear, and also by a tendency of the brain to use other senses such as proprioception or contralateral otolith input to compensate for unilateral lesions. Unilateral centrifugation (UC) is a reasonable method of confining the stimulus to one ear (Schonfeld and Clarke, 2011), but it requires equipment that is prohibitively expensive. Response is generally measured by subjective vertical. Ocular VEMP testing has also been proposed as a method of detecting unilateral utricular lesions. Technically, the ocular VEMP is a tiny response and technical issues remain to be worked out. As the equipment to do ocular VEMP testing is much less expensive than UC, we hope that progress is made. Friedman, in 1970, studied subjective vertical in a variety of clinical situations. It is well known that normal subjects can adjust an illuminated rod in an otherwise completely dark room to vertical within a mean error of less than 2 deg. Friedman concluded that severe derangement of this test is confined to brainstem lesions (such as lateral medullary syndrome) and the immediate postoperative period of peripheral vestibular lesions. Patients with bilateral loss of labyrinthine function can also adjust the vertical on average, but show greater individual differences. Patients with cerebellar lesions generally showed good accuracy of the subjective vertical, suggesting that in patients with spontaneous nystagmus, the lack of a deviation of the subjective vertical substantiates a cerebellar lesion. Patients with brainstem lesions, however, frequently show extremely profound deviations, some as great as 8 degrees. In patients with Menieres disease, operated with labyrinthectomy, a marked deviation toward the operated side was found acutely, with resolution over weeks. Subjective vertical deviation was further assessed, with or without unilateral centrifugation by Schonfeld and Clarke (2011). They reported that a substantial subset of patients have deviations ONLY during UC, and suggested that these are the compensated patients. With respect to unilateral utricular lesions, promising reports are that of Curthoys (1991) and Tabak (1997). Curthoys reported torsional ocular deviations, measured by fundus photographs, of about 2.8 degrees by 16 weeks after unilateral vestibular loss. Tabak and associates found a permanent deviation of the subjective vertical of about 2.2 degrees after a unilateral vestibular loss. These reports suggest a very small tilt of the eyes and sensorium persists long term, that may be difficult to measure reliably. From the perspective of expense, static ocular counterroll can be measured using photography, which is intrinsically inexpensive. Dynamic roll was reported by Averbuch-Heller et al (1997) as being more sensitive to lesions (brainstem, spasmodic torticollus, unilateral labyrinthine loss) than static roll. They also provide an analysis of interactions between the point of regard and torsion, and suggest that ocular counter-roll should be more prominent for distant viewing. Bohmer A, Mast F and Jarcho T. Can a unilateral loss of otolithic function be clinically detected by assessment of the subjective visual vertical ?. Brain Res Bull, 40 (5-6), 423-7, 427-9, 1996. Schonfeld U, Clarke A clinical study of the subjective visual vertical during unilateral centrifugation and static tilt. Acta Oto-laryngologica, 2011.